A new exhibit that's travelling across Alberta showcases the stories of Sixties Scoop Survivors. Shortly after Adam North Peigan was born, he was taken from his family by Alberta Social Services. He spent the next 17 years bouncing from foster home to foster home before finally returning to his southern Alberta community of Piikani First Nation. Peigan describes the return home as culture shock. "Being accustomed to non-Indigenous homes and all of a sudden being … parachuted into a community that I was very foreign to even though it was my own community, it was a very, very troubling time." Peigan's story is one of 12 featured in a new exhibit about the Sixties Scoop, the term used to describe the province's policy of apprehending thousands of Indigenous children and placing them into non-Indigenous foster homes. The Legacy of Hope Foundation in Ottawa created the exhibit, which is being showcased for the first time in Alberta. The Sixties Scoop Indigenous Society of Alberta is touring the exhibit in communities across the province, from Lethbridge to High Level. It's called Bi-Giwen: Coming Home – Truth Telling from the Sixties Scoop and is part of a $200,000 grant to raise awareness and develop online resources for survivors. "When you talk about Sixties Scoop, that's what we really yearn for is being able to come home and be welcomed back into our communities," Peigan, president of the Sixties Scoop Indigenous Society of Alberta. 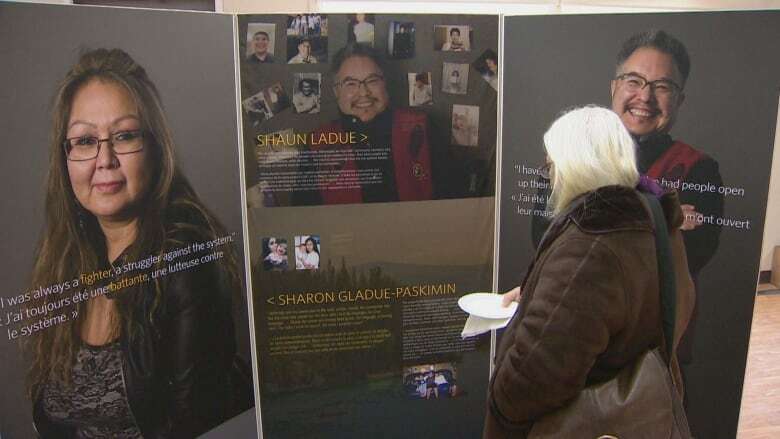 The display boards that make up the exhibit feature the personal stories of 12 survivors from across Canada and are accompanied by photos and videos. 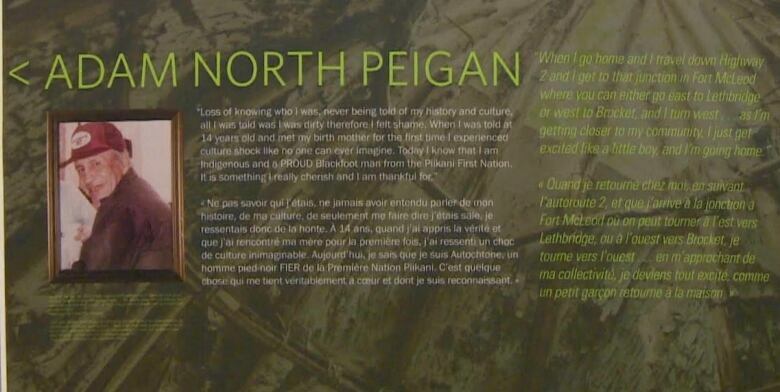 In the exhibit, Peigan is pictured holding his birth certificate — the first solid piece of information about his roots. There's also a photo of Peigan's birth father, whom he got to know after returning to his home community. "He was a part of my life for 10 years, but unfortunately, he passed away," Peigan said. "I still feel robbed today because I didn't have the opportunity to develop a good father-son relationship with my birth father because he left quite early." Peigan said it's gratifying to see his story in the exhibit. "I'm very, very excited for the opportunity ... to share those stories with mainstream Canadians. Because Canadians need to understand that [the] Sixties Scoop was a part of our history as Indigenous people in Canada," he said. It's a history riddled with trauma, as many of the children experienced abuse and loss of culture. Sharing some of their stories contributes to healing and reconciliation, Peigan said. "It's all about sharing our culture and our experiences and our knowledge," he said. 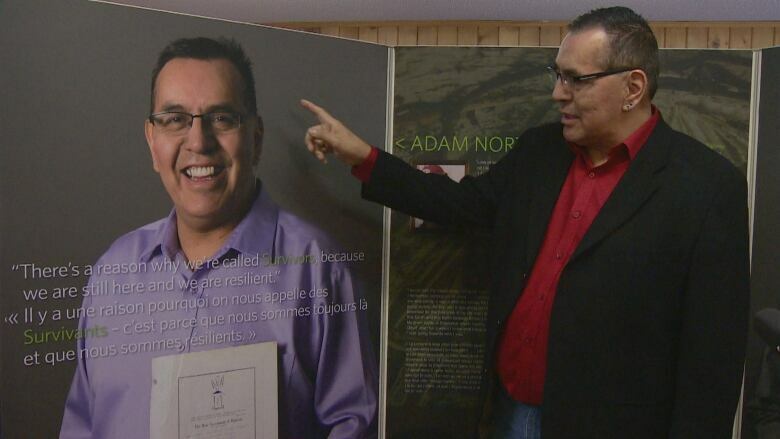 Indigenous Relations Minister Richard Feehan highlighted how the exhibit can help address an education gap, as some Albertans aren't well-informed about the Sixties Scoop. "It's not just about the Indigenous people being able to tell their stories. The rest of us need to also go through a transformation as well — transformation of understanding," he said. "For many years in this province the Indigenous people were the neglected people. In the Métis national anthem, they actually refer to themselves as the forgotten people. And that is not okay." The provincial government apologized for the Sixties Scoop last May. "Today is one more step — not the final step, not the first step, we know — but one more step in our journey forward both in reconciliation but also in change," Feehan said. End of May - Final showcase in Edmonton. Exact date to be determined.